Time to read: 10 minutes (based on 150 wpm). Communication is the act of transferring a message from one individual or a group to another individual or a group. The message is transferred following a predefined scheme, called language. A medium is used to transfer the message between the two groups or individuals. Many theories try to explain communication, but in summary they all contain similar elements. Once again, consider Wikipedia, if you are curious about details: Communication theory. Source – this is what the sending side is trying to communicate. Message – the information, concept or generally any communication. Sender – the person who encodes the source into a signal. Usually this happens using a language, accepted by both parties. However, this is not necessary. Signal – this is what the Sender sends to the Receiver. Medium – this is where the Signal travels. It could be air, paper, the Internet and so on. Noise – this is any interference over the Medium, which might cause the Signal to be distorted. Received signal – this is what the Receiver ultimately receives (potentially changed by Noise). Destination – where the message is intended. 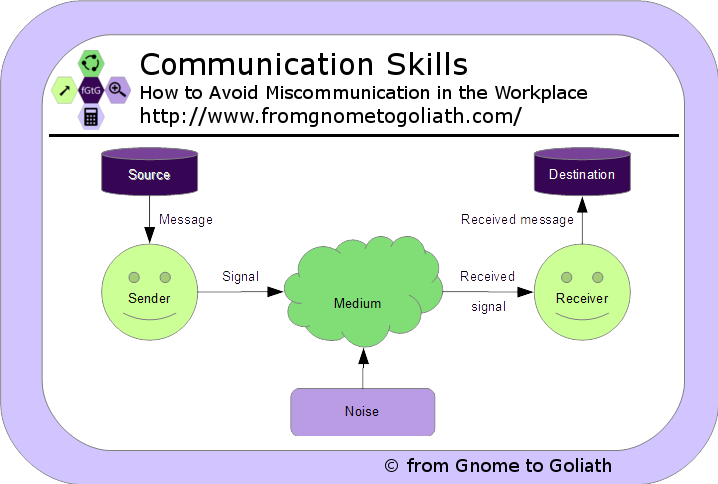 The Sender needs to communicate something (Source) to the Receiver. After encoding the Source to a Signal, the Sender sends it over the Medium. During the time it takes the Message to reach its destination, the Signal is potentially distorted by the Noise. Source: Peter needs a sales report on Product A. Peter thinks that John can do that report. Message: John, could you please send me a sales report on Product A. Signal: Email message with the same text. Received signal: Email message with text, changed by Noise. Received message: John, could you please send me a sales report on Product B.
Destination: John has to sit down and do the sales report on Product A. Probably you all know that miss-communication is responsible for more than a quarter of the failed projects overall. Let us use communication theory on our example and analyze the outcomes. Let us assume that Peter is fairly sure that John can do sales report. … Peter has no authority over John? Probably, John will receive the message and do nothing. A better approach was to ask John’s supervisor for help. Or if this happens across departments: Peter should ask his manager to ask John’s manager for help. … John is not responsible for Product A at all? Then the whole assumption is wrong and Peter has to find out who can do that. … Peter wrote “John, could you please do a sales report on Product A.” and forgot to specify that John has to send the report back? Then probably John would do the report and upload it somewhere, like he usually does. And Peter will never receive it because he expects an email from John. … John is not sure for which time period should he do a sales report? Peter will receive something which is not needed or helpful. … Peter did not have enough time and simply wrote: “John, I need a sales report on Product A”? John will look into the database and send back the last generated report. Peter will not be happy because he wanted a new report with the latest data. … Peter used the corporate instant messenger to send the message and John never uses it. Peter will wait for the report for days and may not receive it. … instead of receiving “Product A”, John receives “Product B”? John will do the report, send it back to Peter. And after that it will turn out that he has to do another report, but for Product A. … instead of John, Juliana receives the email? She will most probably ignore it and Peter will wait for days. ... John receives the message, creates the report, uploads it to the shared server and replies: “I did it!! to Peter? Peter will not be happy, because he did not receive what he wanted, even though John did what he thought was right. … John receives the message and creates a report for Product A, but from Product Line X, which was not intended? Peter will again receive something that was not needed. I already covered that, but what if John was not the correct person for that request? Be mindful of the communication process. If possible, try to break down the different parts and analyze what can be improved. Communication is what you are doing every day to interact with the other people around you. 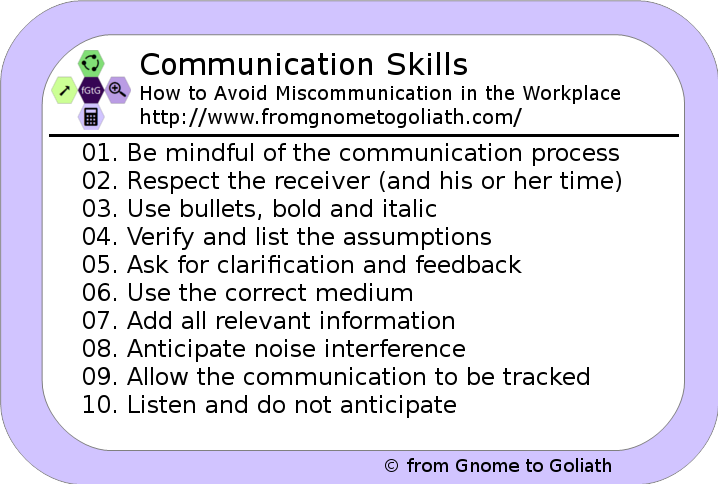 Communication skills is what could help you achieve more with less and stay competitive in the current dynamic environment. And last but not least, communication theory can teach how to become more efficient when communicating. You will be able to tell the others what you want to tell them. And on the other hand you will understand better what they are tying to tell you.